Marcus Valerius Martialis, known in English as Martial, was a Latin poet from present-day Spain, best known for his twelve books of Epigrams, published in Rome between 86 and 103 C.E. Martial is considered the father of the modern epigram; his short, witty poems—1,561 in all—provide brief, vivid, and often extraordinarly humorous portraits of members of the Roman populace. Martial wrote a number of epigrams for emperors, generals, heroes, among others; but what perhaps marks him as the most innovative epigrammatist in ancient history is that he also, frequently, took ordinary people for his subjects. Martial wrote epigrams on slaves and senators alike, and his work surveys, and satirizes, every level of the Roman social strata. Martial's epigrams, with their brevity and wit, have often fared better in translation and over the centuries than dense epics and lyrics of his fellow ancient Romans. He remains one of the most enduringly popular of all Latin poets, and he is credited, to this day, as one of the most influential satirical poets of all time. Knowledge of Martial's life is derived almost entirely from his works, which can be more or less dated according to the well-known historical events to which they refer. In Book X of his Epigrams, composed between 95 and 98 C.E., Martial mentions celebrating his fifty-seventh birthday. He was, therefore, likely born on March 1, 40, under Caligula or Claudius. His place of birth was Augusta Bilbilis in Hispania. His parents, Fronto and Flaccilla, appear to have died in his youth. His name seems to imply that he was born a Roman citizen, but he speaks of himself as "sprung from the Celts and Iberians"; it is likely therfore that Martial's family was not ethnically Roman, but had attained enough wealth and status to earn Roman citizenship. He lived in a relatively well-to-do household and enjoyed a life of relatively leisure and luxury. He was educated in Hispania, a country which in the first century produced several notable Latin writers, including Seneca the Elder and Seneca the Younger, Lucan and Quintilian. Martial professes to be of the school of Catullus, Pedo, and Marsus, and admits his inferiority only to the first. Catullus' influence on Martial is clear, from his choice of subject-matter to his demotic and often satirical tone. 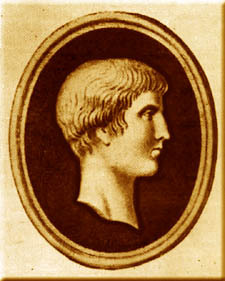 Martial moved to Rome in 64 C.E., perhaps encouraged by the literary success of his fellow countrymen. It is suggested, though unclear, that during his first years in the city he lived under the patronage of Lucan and Seneca the Younger. We do not know much of the details of Martial's life for the first twenty years after he came to Rome. He published some juvenile poems of which he thought very little in his later years, and he laughs at a foolish bookseller who would not allow them to die a natural death (i. 113). From his correspondence it may be inferred that his friends and family urged him to practice law, but that he preferred his own shiftless, Bohemian life. Through writing a number of occasional poems he made many influential friends and patrons, and secured the favor of both Emperors Titus and Domitian. It is through these acquaintances that Martial was able to scrape together a living, surviving on donations and commissions from the nobility. The earliest of his extant works, known as Liber spectaculorum, was first published at the opening of the Colosseum during the reign of Titus. Two books known by the names of Xenia and Apophoreta, which consist almost entirely of couplets describing gifts given to various members of the nobility, were published for the Saturnalia in 84. In 86 Martial gave to the world the first two of the twelve books of epigrams on which his reputation rests. From that time till his return to Hispania in 98 he published a volume almost every year. The first nine books and the first edition of Book X appeared in the reign of Domitian, while Book XI appeared at the end of 96, shortly after the accession of Nerva. A revised edition of Book X, that which we now possess, appeared in 98, about the time of the entrance of Trajan into Rome. The last book was written after three years' absence in Hispania, shortly before his death. His final departure from Rome was motivated by a weariness of the burdens imposed on him by his social position, and apparently the difficulties of meeting the ordinary expenses of living in the metropolis (x. 96). The well-known epigram addressed to Juvenal (xii. I 8) shows that for a time his ideal was realized; but the more trustworthy evidence of the prose epistle prefixed to Book XII proves and that he could not live happily away from the literary and social pleasures of Rome for long. The one consolation of his exile was a lady, Marcella, of whom he writes rather as if she were his patroness. Removed from the bustling life of Rome that inspired so many of his poems, Martial at last died, in his native land, in 102 or 103 C.E. Martial had a keen sense of curiosity and power of observation, which shines through in his epigrams. The permanent literary interest of Martial's epigrams arises as much from their literary quality as from the colorful references to Roman life that they contain. Martial's epigrams bring to life the spectacle and brutality of daily life in imperial Rome, with which he was intimately connected. "I live in a little cell, with one window which doesn't even fit properly. Boreas himself would not want to live here." Book VIII, No. 14. 5-6. "Tongilianus, you paid 200,000 sesterces for your house. An accident, too common in this city, destroyed it. Now I ask you, doesn’t it seem possible that you set fire to your own house, Tongilianus?" I didn't have a fever, Symmachus, when I called you –but now I do." and you call for a whip. to the degree that suddenly you are a raven, but lately you were a swan. and that nothing is purer than your fleshly delights. if you have the decency, move your underwear onto your face." "You say to me, Cerylus, that my writings are crude. It's true. But that's only because I write about you." ↑ Shelton, Jo-Ann. As the Romans Did: A Sourcebook in Roman Social History. New York: Oxford University Press, 1988. Epigrammata (in Latin) at Bibliotheca Augustana. Epigrammaton (in Latin) at The Latin Library. This page was last modified on 24 August 2018, at 15:08.